The national level training programme for teacher educators has been scheduled in consultation with UNESCO Bangkok. 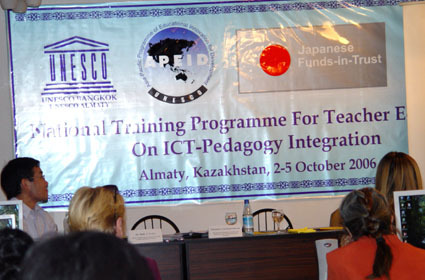 UNESCO Almaty with National Center for Informatization identify and invite 25-30 teacher educators from universities, and teacher education institutions located in different parts of Kazakhstan. During the five days of training, participants will be exposed to training modules and activities that have been developed to build the capacity of the trainees in pedagogy-technology integration. To facilitate learning there will be discussions and demonstrations on issues such as what strategies are to be adopted, what pedagogical approaches are most appropriate and what kinds of ICT are more suitable for a particular type of learning in the classroom.